Canadian metal legends ANVIL will embark on a U.S. tour in late spring. The trek starts May 2 in Buffalo, New York and runs through June 16 in Canton, Ohio. Jun. 08 – Rock Island, IL @ Rock Island Brewing Co.
Jun. 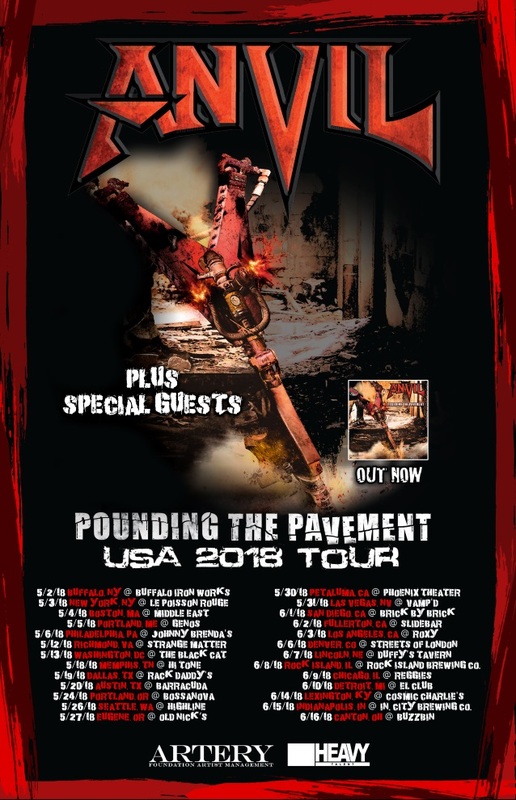 15 – Indianapolis, IN @ Indiana City Brewing Co.
ANVIL‘s latest album, “Pounding The Pavement”, was released on January 19 via SPV/Steamhammer as a digipak version (including one bonus track and poster), two-LP gatefold colored version, digital download and stream. The disc was produced at the Soundlodge studios in Rhauderfehn in the northwest of Germany, where ANVIL found not only the necessary peace and seclusion to concentrate on their recordings, but also met in studio owner Jörg Uken the ideal producer for their ambitioned work. Despite the diverse range of their ideas, Kudlow, drummer Robb Reiner and their bassist Chris Robertson have succeeded in filling the typical trademarks of this unusual band with life once again — which is an important aspect for every ANVIL release. After all, tradition and reliability play an essential role in this group. Kudlow says: “Of course we always allow inspirations from earlier recordings to seep in, but always with an emphasis on evolving the characteristic ANVIL sound.